Hello all! Its December and for Simon Says Stamp fans December this means DieCember! The month-long celebration of all dies and die cutting! Yay! 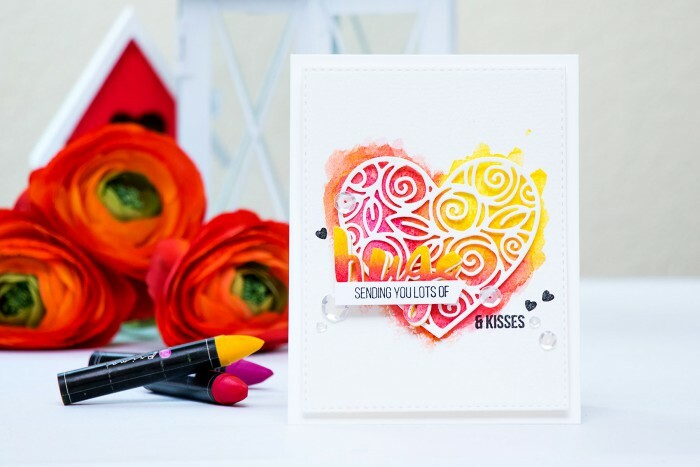 I have a watercolor Valentine’s Day card and video tutorial to share in this blog post. I’ll also be sharing another card and video tomorrow, so stay tuned (and I also have a card and a video featuring new Limited Edition Holiday Card Kit from Simon). I started working on my card by creating a heart-shaped watercolor background using Prima’s Water Soluble Oil Pastels. I used these for the first time and I’m very happy with the quality and the “easiness” of use. I used 3 colors – yellow-orange, red and magenta and first just drew a heart outline on my Arched Cold Press Watercolor paper. Next I filled the heart shape in using the same colors and added water. Finally, I die cut it the panel using Simon’s Stitched Rectangle die. I created a similar background in terms of colors on another, smaller piece of watercolor paper and used that to die cut a Hugs word out. I also die cut one more Hugs out of white cardstock and one more out of yellow craft foam. I added adhesive sheets to both front and back of the craft foam prior to cutting it to make the die cut sticky. I adhered white Hugs onto yellow craft foam Hugs and adhered the watercolor Hugs on top of that, but I offset it slightly (to create an illusion of white shadow). I also die cut a gorgeous heart using Heart of Roses die out of white cardstock and foam mounted it onto my watercolor background. Added the Hugs die cuts on top, stamped additional “Sending you lots of” sentiment onto a strip of white cardstock and adhered that on top of the hugs. 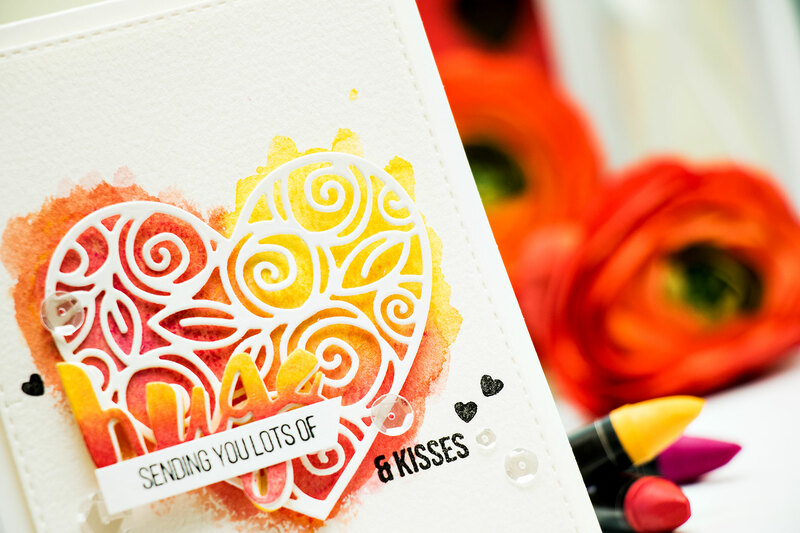 I also stamped “& Kisses” and a few hearts and foam mounted my panel onto an A2 top folding card base. Like this video? Please give it a thumbs up and share with crafty friends. Thank you! Your background is beautiful, love the colors, that heart die is so delicate….love it! Very cool card. Love how you tied the die cut and the background together. Well done. Beautiful! Love this delicate die! Love your background. This is such a great die. Love your painted background to show case this beautiful die. Very pretty card but the hugs is lost on it. I had to look really hard to see it because it blends in so good. 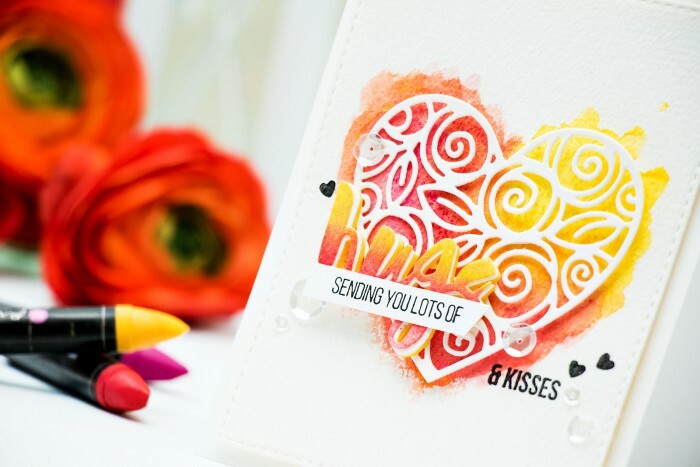 Love the watercolor background with the Heart of roses die, beautiful card and thanks for video! Such a lovely card. Love the watercolors behind the heart and the thanks that matches it. Great background. Love that die. Awesome background love that die makes such a beautiful card with lots of options. Gorgeous card! Love this die and thanks for the great video! Wonderful background for this pretty heart die. Love the new dies, and your card is awesome! Love the watercolor background and this die from SSS is just beautiful. Thanks for sharing and inspiration! Wow, what a stunner! Fab new goodies … and I love how you achieved all that dimension! I love the colors used…they just POP!! Love the card and the colors! Fabulous video. So many great tips. Wonderful card too. This is so pretty Yana! I love the bright colors… so cheerful! your card is one of my favorites in this hop! Absolutely AWESOME water colored background to show off this beautiful die! Gorgeous card! I just love this detailed heart die! Such a lovely card too with your fabulous colors! So pretty! I love coloring behind the die! Gorgeous colors on the background! Thanks for sharing. The watercolor background really sets off the heart! Love it. Love the watercolour under the die. Very pretty idea. Beautiful watercolour card . Love it. LOVE YOUR CARD! I WILL BE MAKING ONE SOON! TY!